← Best potatoes on the planet!!! I found this really cool idea. 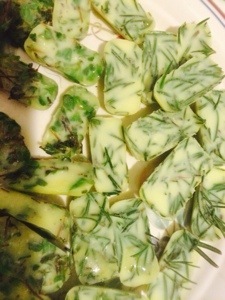 I have pots of of Rosemary and Marjoram outside on my deck but the weather is getting cold and they’re going to die. 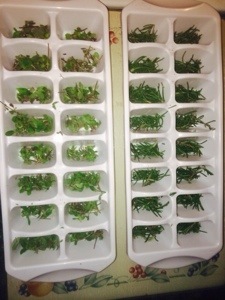 So I took some scissors and cut up the leaves into ice cube trays and then poured a little olive oil into each cube. They froze beautifully and I will be able to take them and throw them in a pan to sauté whenever I want a little flavor throughout the winter!